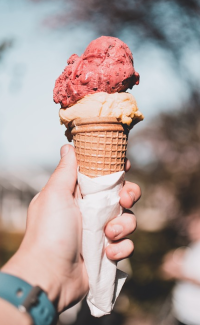 A scoop or two of ice cream is the perfect way to cool down on a hot summer day and Delaware has you covered when it comes to finding delicious frozen treats from the beaches to the northernmost tip of the state. Whether it’s a classic vanilla perfected over generations you’re looking for, or a one-in-a million creamy creation, you’re bound to find a new favorite in Delaware. Offering traditional sweet ice creams like vanilla to modern, creative savory ice creams like “Motor Oil” and “Bacon,” Woodside Farm Creamery has something for every ice cream fanatic no matter how adventurous. Try your selection in a homemade waffle cone and give the dairy cows on this 220-year-old farm a pet on the snout before heading home. As the brainchild of University of Delaware students, UDairy Creamery serves up innovative creations made with milk from cows living on the University’s College of Agriculture and Natural Resources’ farm. Keep an eye out for the UDairy ice cream truck at festivals and events across the state. Nearing 50 years in business, King’s is now managed by the family’s third generation serving up premium ice cream, frozen yogurt and water ice in historic buildings in Lewes and Milton. Both shops have an old-fashioned ice cream parlor feel with traditional options like root beer floats and banana splits. Despite its popularity, King’s makes all ice cream in-store, in small batches to ensure every flavor meets the business’ high standards. Situated on Route 404, Vanderwende’s is the perfect stop if you’re traveling from the west to Delaware’s beaches. Offering 30 flavors, the ice cream is made with milk from the farm’s dairy cows. If you’re looking for Vanderwende’s by the pint or quart, visit the website to see locations where the ice cream is sold across the state. The Frozen Farmer, based on Evans Farms is taking farm-to-table to the next level by mixing local milk with ingredients straight from the farm to create tasty ice cream. The Frozen Farmer also offers fruit-based frozen treats for those looking for vegan, gluten-free, low-fat or fat-free options. Make any gathering extra special by hiring their ice cream truck to serve at your event. Located on Green Acres Farm, Hopkins Farm Creamery is the largest dairy in Delaware and started churning ice cream in 2008. The Creamery offers more than 25 delicious flavors, all created right on the farm from the milk of the resident cows. A short drive from the beaches of Lewes, Rehoboth and Dewey, Hopkins is worth the trip. Nestled on Rehoboth Ave. just off the boardwalk, Mug & Spoon offers milkshake creations that are pure works of art. Order yours topped with anything from a slice of chocolate cake to a cone of blue cotton candy. Be sure to look up once you enter, you’ll be surprised by what you see! Although founded in York, PA back in 1919, Kohr Bros. Froze Custard has become a boardwalk staple offering soft serve custard from their walk-up counters. Try their signature Vanilla/Orange Sherbet spiral with “jimmies” aka sprinkles for an authentic experience. Sample ice creams from many of these shops at New Castle County Ice Cream Festival held in Rockwood Park every June.